After picking up cupcakes to bring home, it was definitely time for lunch. We were all pretty hungry and eager to get on the road at this point so we didn’t want to go far for food. We were in luck though because this area of Clark Street is filled with different food options! Just a few doors down from Molly’s Cupcakes is a place called Frances’ Deli. Although it looked like a pretty small space, the tables were packed together and it filled up quickly with people eating lunch. It has been in the Lincoln Park neighborhood in Chicago since 1938 and definitely has an old school deli feel. The menu has a LOT of different options including breakfast all day! It really seems like pretty much anyone could find something to eat here. For my meal I had a grilled cheese sandwich and a side salad. Both were delicious! 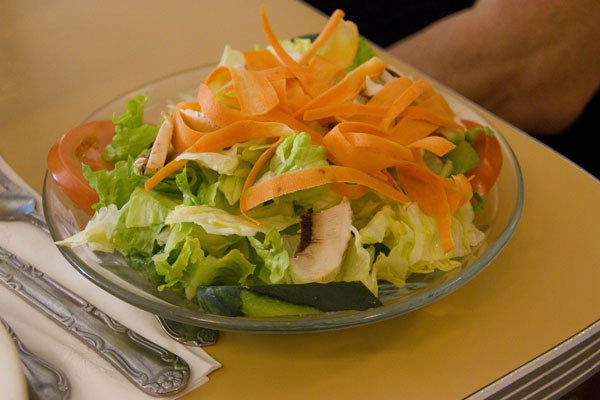 The salad was very fresh tasting and actually quite large for a side salad – check out that shaved carrot! 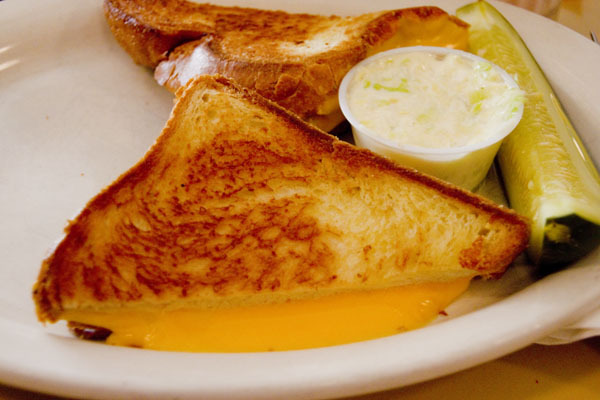 The sandwich had perfectly melty cheese and the thick cut bread was delicious. And I LOVE the deli-style pickle slice. The meal came out quickly and although it was a bit hectic in the restaurant with the lunchtime rush, the waitstaff was friendly too. Overall it was a good meal and everyone took home their leftovers! Taste: A, delicious cheesy sandwich and surprisingly good salad. Cost: A, my sandwich and salad were just what I wanted. Light enough for lunch, but still a decent amount of food! Would I go there again? Since there are SO many different restaurants in that area I’m not sure that I would go there again, but if someone suggested it I definitely wouldn’t turn it down.